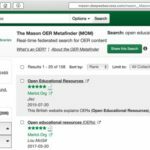 The Mason OER Metafinder helps you find Open Educational Resources. Unlike other OER repositories (e.g, OER Commons, MERLOT, OpenStax, etc.) with our Metafinder you aren’t searching a database that we built. Many other sites already perform this important curation service and to be honest, we don’t have the time or staff to build or even maintain currency in that sort of database. Instead, our contribution to the progress of Open Education is to concentrate on OER discovery—helping you find current content wherever it resides–even if it’s a new OER title that just dropped earlier today. A distinct feature of the Mason OER Metafinder is the scope of our discovery service. We’re searching well-known OER repositories like OpenStax, OER Commons, MERLOT but also sites like HathiTrust, DPLA, Internet Archive and NYPL Digital Collections where valuable but often overlooked open educational materials may be found. Our OER Metafinder is built using the Explorit Everywhere! software developed by Deep Web Technologies in Santa Fe, New Mexico. We use their software to provide a number of different metafinders for Mason researchers (e.g., our Sciences Metafinder is a quite popular example). If you want to know more about the Metafinder or have ideas for additional search targets, contact Wally Grotophorst. To keep up with the latest news about the Metafinder, follow @OerMason What are we searching? Is there a Search Widget? Click here for code to place an accessibility-standards-compliant OER Metafinder search widget on your website. Is there a simple link to the service? Who’s using the Mason OER Metafinder (MOM)? Here’s a list of libraries and other organizations linking to us from an OER guide as of March, 2019. Beyond giving a shout-out to sites using MOM to discover OER content, the list also pulls together OER information guides from 320+ organizations. If your organization is offering a link or search box for our metafinder and you’re not on our list, send us an email.